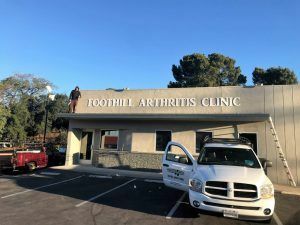 Building Letters for Rheumatologist Office in Tujunga, CA | Dan La, M.D. Dan La is a rheumatologist in Tujunga with a new location. He wanted to make sure that his existing patients would find him in his new building while also advertising to new patients. His business name is just his name and his profession, Dan La M.D., but he didn’t want to display that for the sign. There are many cases where a business will make their business type more prominent than the actual company name for advertising purposes. I’m sure that on more than one occasion, you’ve seen a sign that reads “CHINESE FOOD” in large red lettering, and the name of the actual restaurant is displayed smaller or not displayed at all. This is the idea that Dr. La had for his signage. 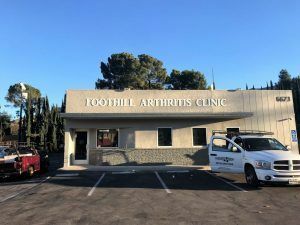 His name won’t tell consumers anything about the company, but “Foothill Arthritis Clinic” definitely does. At one fell swoop, the sign gives the location of the business and the business type. When we first went to the location, Dr. La hadn’t done any work on the exterior and the building was painted white. When he told us that he was considering white lettering, we were a little worried because the lettering wouldn’t stand out too well but he advised us that he was planning on painting the exterior gray with navy accents. Since we didn’t know the exact shade of gray yet, we kept painted options in mind and the client was open to any color suggestions. Earlier on in the quoting stage, we also explored illuminated options. The idea was to make reverse-lit channel letters and paint them whatever color suited the exterior. In the end, we decided to go with white acrylic dimensional letters. The facade was dark enough to contrast with the lettering, and Dr. La opted for a non-illuminated sign. Since acrylic comes in white, the letters where flat-cut from the acrylic in the font that the customer chose. We used 1/2″ thick acrylic. Since this sign was to be outdoors and the letters were pretty tall, we wanted to go with a thicker material. There was only one change made during the proofing process, which was the positioning of the sign. We were initially going to start the lettering from the left end of the building but after seeing the rendering, Dr. La decided to have it centered above the awning. Feel free to check out other exterior dimensional letter signs we’ve done on our website gallery.